With music ripped off from Halloween, this politically parody says all the things the Bernie Sanders level of left has to say about our current administration in a Trump masked Michael Myers. All sides are represented in the one-sided slasher commentary. Dr. Clinton (Aubrey Manning) dies for Trump to rise. The adored Obama gives almost rational speeches. Bill walks towards his grave reminiscing about his favorite booty and the names of those who died to make it happen. And off course the star David in a Trump mask reads out of body racial and idiotic slurs as if they were tweets from the POTUS himself. In a world of a Donald Trump slasher “food stamps have been discontinued so now the impoverished get a "fiesta box”. Racial, sexual and political stereotypes will be touched upon. The Americans who voted Republican in the last presidential election and the Russian hackers who made up the rest of the 46.1% to get the president elected will not find this movie humorous. The current 53% of Americans who disapprove of our current administration will. I’m not typically a fan of satire films especially those that are so over-the-top they become spoofs. I also don’t like to see political posts on social media platforms any more than I like forced political statements in cinema. President Evil lives up to its name and cover in every way. It is a Leslie Nielsen worthy Scary Movie with Mel Brooks level social commentaries. As an Independent critic who falls somewhere in between believing our current president is the devil incarnate and the savior of this country, I have to say I unbiasedly enjoy this low budget, over-the-top, political spoof and that’s not fake news. This presidential abomination of Richard Lowry and Gregory P Wolk would make Jim Abrahams and David Zucker proud. When the “President” went to kill his first victim and he had tiny hands I knew I was in for a treat. As someone who doesn’t keep up with all the happenings in the country’s “news” I’m sure there are tons more digs at the President I missed. 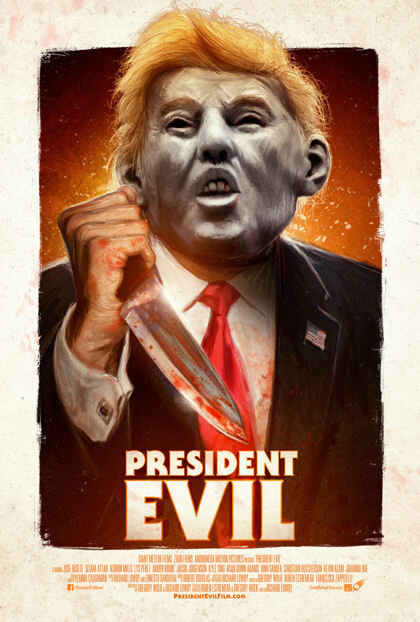 It’s kind of like any extreme satire; if you’re a Dragnet fan you might not like Naked Gun, if you’re a Scream fan you might not like Scary Movie and if you’re a Trump fan and you don’t have a sense of humor about it, stay away from President Evil if the title doesn’t give that away already. For everyone else, Don’t let the white man keep you down. Enjoy impeaching this fucker to the score of Halloween!